I've had one goal since moving to New York City, and that's to fill my days with experiences I could never have anywhere else in the world. Touring the flagship Tiffany & Co store on 5th Avenue is certainly the most New York City thing I've done since I became a New Yorker. This opportunity was only possible thanks to an old high school classmate reconnecting with me on Instagram. Before I met up with Hannah this morning on the bustling first floor showroom of the 5th Avenue Tiffany & Co store, we hadn't seen each other since graduation day. Hannah has worked with Tiffany & Co for three years, now as a Client Development Manager. I wasn't sure what to expect when she invited me to take a peek at the impressive collection and go behind the closed doors of the luxurious salon. Would I be chased out for very obviously not fitting the socio-economic profile of Tiffany's top clientele? Should I wear a black dress and pearls a la Audrey Hepburn? Can I please try on the big, sparkly diamonds if I promise to give them back? Regardless of my questions, I quickly accepted the invite. Hannah lead me around the main level of the store, where I was quite surprised to find so many tourists lugging large backpacks and sporting sensible walking sneakers around the impressive cases of diamonds and jewels. "They're mostly tourists. But then you'll get one client who drops $20,000 without blinking." Hannah shrugged a little, admitting, "We're a bit jaded here." After three years of such luxurious surroundings, working by the twinkling light of diamonds, and dealing in values of four, five, and six zeros, I would be jaded, too. I tried on one piece on the first floor. This bracelet boasted over 1,000 diamonds and a price tag more than 500 times that. Yeah, over $500,000. I was afraid of looking like another tourist on the first floor, so this first and only shot was taken with my iPhone X. Not sure even the most advanced camera could do this piece justice. "Don't worry. We finance," Hannah joked. Once the piece was safely back in the case, we snuck up the front elevator to the most exclusive level of the store. 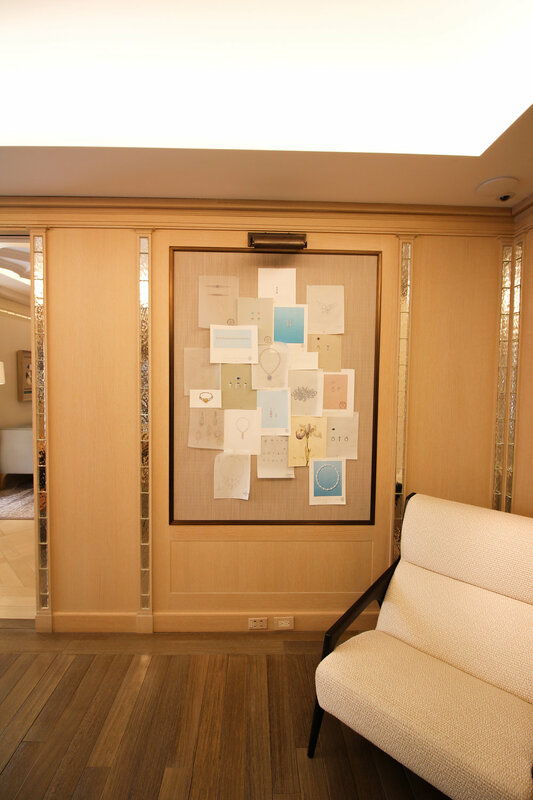 The Salon at the flagship Tiffany & Co location is an appointment only, closed doors experience for elite Tiffany clientele. If a client would prefer to explore the collection and make purchase decisions in a lush, quiet environment with an ultra-personal experience, the Salon is the destination. The space was designed to be an apartment, so the interior is cozy and bright. 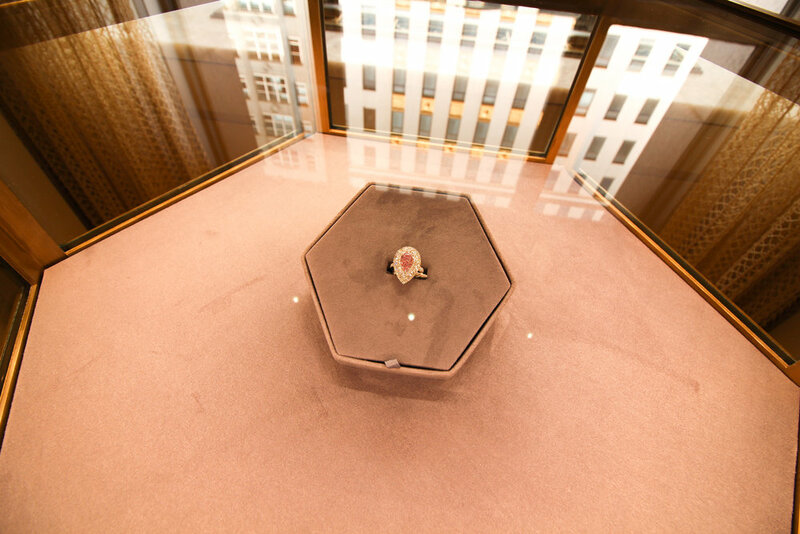 Some of the more impressive archival pieces and special items are carefully encased in the Salon, including this pink pear-shaped diamond ring valued at over $6 million. Tiffany & Co is responsible for all of the jewelry designs seen in The Great Gatsby. The price of this diamond and pearl cuff bracelet, on display in the Salon, is available upon request. Should you be shopping for a special black tie affair, and need to ensure your new ice drapes just right along the neckline of your gown, you can see the entire ensemble together in the private dressing room. Or you can take selfies showing off your streetwear, either one works. Every major jewelry investment goes better with a little liquid encouragement, and Tiffany & Co ensures the champagne (and vodka and whiskey) keeps flowing. 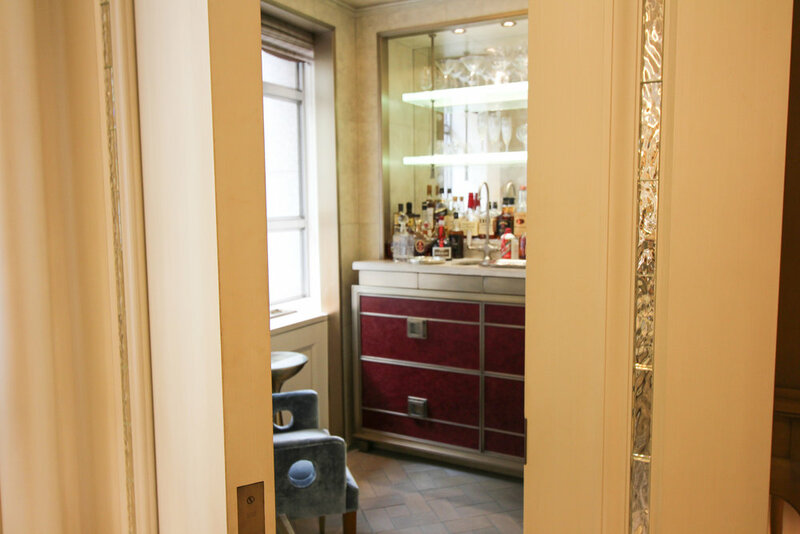 With a full-time waiter on staff in the Salon and other private rooms, guests are promised a bottomless chilled drink, and of course, breakfast if desired, during their experience at Tiffany. 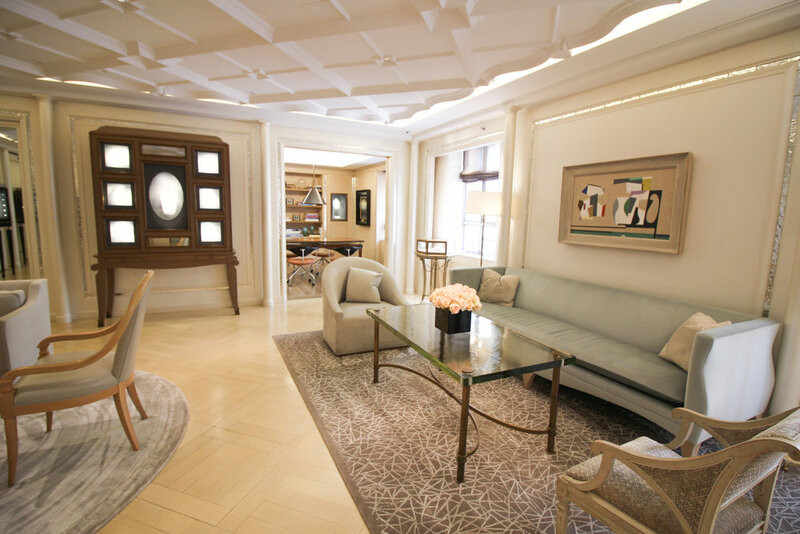 The Salon space was once occupied by the studio of Tiffany designer Jean Schlumberger. His pieces, according to the Tiffany & Co website, were coveted by the likes of Jacqueline Kennedy and Vogue editor Diana Vreeland. I could've stayed in the creamy white space lounging on the iconic blue couch, sipping champagne and peering out the 5th Avenue windows all day long. Unfortunately, a real client with real dollars had the room reserved shortly after my visit, so Hannah lured me away from the private space with the only thing that could tear me away from a setting so beautiful -- diamond engagement rings. What does a $700,000 diamond ring look like? Hannah removed the six-pronged, platinum setting, more than 20 carat diamond ring from the case and my first reaction was probably embarrassing. "It looks fake!" I said in my out loud voice to Hannah and her two colleagues who had flocked to our side upon approaching the piece. It was heavy, wider than my dainty 4.5 size ring finger, and sat nearly a half-inch above the band. Imagine seeing such a creation perfectly perched in an iconic Tiffany blue box, and holding it nervously, the man of your dreams asking for your hand in marriage. I'm not tearing up, you're tearing up. 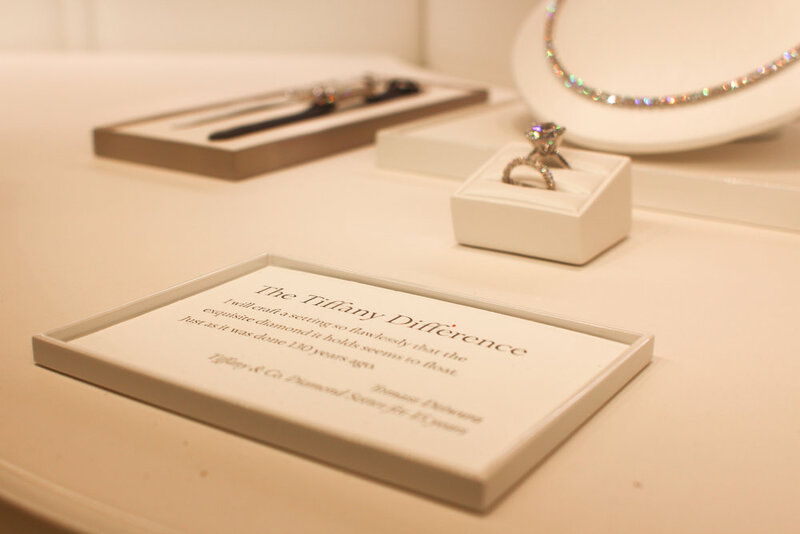 The glamour and luxury of the flagship Tiffany & Co store is undeniable. I wished I had ignored Hannah's insistence that jeans were acceptable attire, just to fit the part a little better. I did see at least one woman in full Holly Golightly garb. I'm not sure I'd go that far... But I appreciate the dedication to the iconic film.